Internationally recognized strength and conditioning coach Ashley Jones introduced Iron Neck training to the Samoan Rugby Union and New Zealand Crusaders this year. In this article, published on EliteFTS.com, Jones provides an overview of the landscape of neck training and the many ways he is experimenting with Iron Neck to take his training even further. In the 1970s, the Nautilus Sports/Medical Company released a range of equipment specifically designed to strengthen the neck. These were the neck and shoulder (seated shrug), the four-way neck (seated flexion, extension, and lateral flexion left and right) and the rotary neck (seated rotation, looking left to right and vice versa) machines. Of these, the rotary neck is definitely the hardest to find in the marketplace. There are quite a few of the two other original pieces to be found, and many other companies now produce a four-way neck and shrug machine. 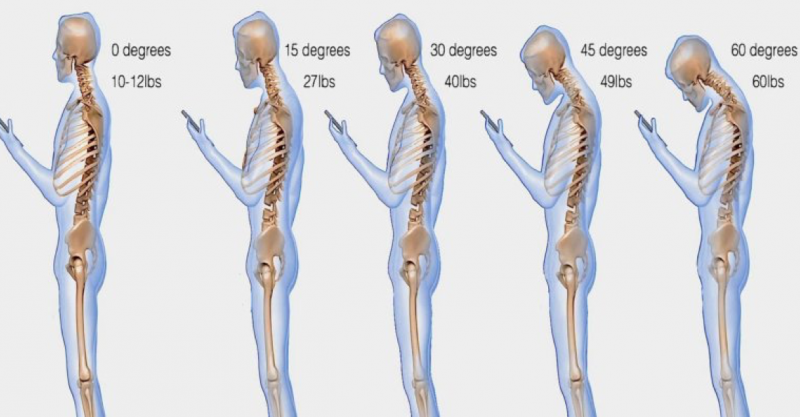 The average head weighs approximately four and a half to five kilograms (10 to 12 pounds), and as you can see from the graphic below, the weight that the neck musculature must support increases dramatically with the degree of head tilt involved in attending to your phone, hence the importance of balancing this action with at least extension exercises for the head and neck complex. There are many options available to strength and conditioning coaches and trainers to train the neck musculature. There are self-administered isometric holds and working with a partner isometrically or through resisted range of motion exercises. There are neck harnesses for the major neck movements, as well as isometrics holds while performing other movements such as a bent row. There is also a plethora of neck strengthening drills that the sport of wrestling has produced, with wonderful effect, over the years. Remember, as Louie Simmons and Dave Tate are often quoted as saying, “if the only tool in your toolbox is a hammer, everything becomes a nail.” So while all the movements discussed above have merit and their place in the training toolbox, a new device has entered the playing field that I feel warrants your attention. The Iron Neck, as pictured below in a rugby-specific body position of the athlete, allows a portable device that can be connected to any structure and allows the athlete to perform all the major neck movements in both isometric and isotonic fashion, using both linear and rotational resistance at varying degrees. I am currently trying it out with a rugby team and will use it as a part of the strength program for developing neck strength. I will also be taking it to the field and using it as a specific warm-up or primer for players prior to contact sessions or scrimmaging sessions. Nate Harvey provides five standard movements that are sport-specific here. A program should include full range of movement shrugs to augment any specific neck training. This should be performed with a range of grips and using dumbbells, kettlebells, straight bars, and trap bars, and often combined with a farmer's walk as well. I like to incorporate wrestling drills for the neck with contact sessions on the field but will always get a wrestling coach to teach these with the players. I do like to program the four-way neck into an overall neck strengthening protocol since I believe that variety of stimulus is very important for long-term compliance. My greatest wish, though, is that we educate our players to such an extent that The Iron Neck becomes part of the “tools of the trade” for contact athletes and that they have their own, as part of a professional approach, to not only performance but also long-term health and welfare. Ashley Jones has been a professional coach for over 25 years across three sports Basketball, Rugby League and Rugby Union. He is currently the Head of Physical Preparation for the Samoan Rugby Union based in Apia, Samoa. 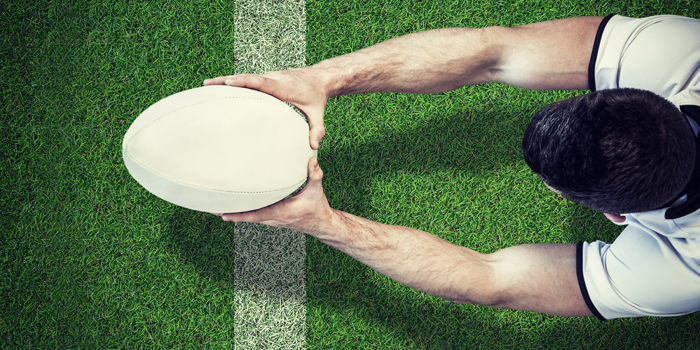 Having previously worked with three other international rugby teams (New Zealand, Australia & Scotland) and professional clubs in New Zealand (Crusaders), Japan (Panasonic) and Scotland (Edinburgh). He was awarded the NSCA Professional Coach of the Year for 2016 and holds the CSCS since 1988 as well as the RSCC*E recognising over 20 years of professional coaching.